On Tuesday, Feb. 2, DriveCam conducted a Safe Driver Recognition Program in the Board of County Commissioners Chambers to acknowledge Orange County Government Employees with safe driving records. DriveCam, a camera that is installed in Orange County Government automobiles, captures video when a vehicle sustains certain force. Orange County implemented the DriveCam program nine years ago. In order to be recognized as a safe driver, employees must drive at least 5,000 miles per year and three consecutive years without an at-fault DriveCam recording. Safe drivers received a certificate of recognition and appreciation. The camera is located near the rearview mirror, and captures video when the driver makes a hard stop, crashes or swerves. When the vehicle is not turned on, the camera switches into sleep mode. The purpose of DriveCam is to address driving mistakes and ensure proper procedures are followed. The video also assists if the County is involved in litigation resulting from traffic accidents involving employees. John Petrelli, Director of Risk Management and Professional Standards, offered the opening remarks as well as a presentation regarding statistics before and after DriveCam was in effect. Petrelli said the program has been a positive influence on the County’s accident record. 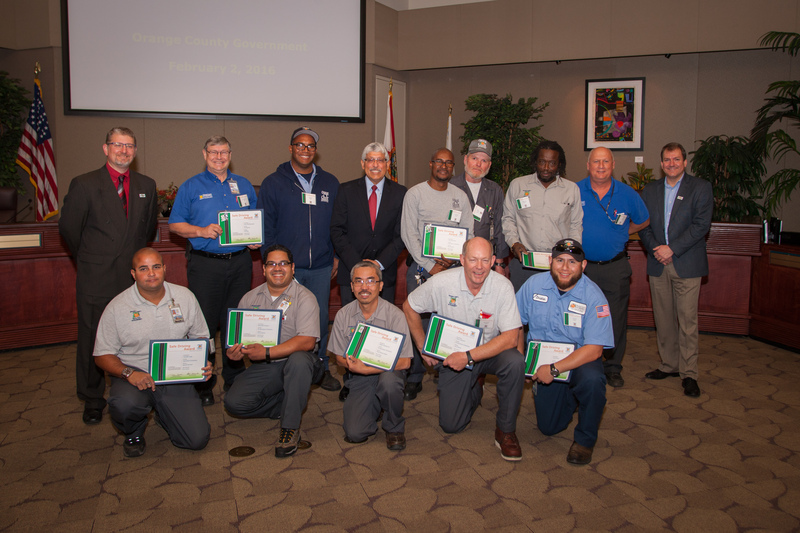 This year, 20 Orange County employees from various departments including Utilities, Facilities, Fire Rescue and Building Safety were recognized as safe drivers.